LIFEHACKER FEATURED ME... THANK YOU SO MUCH! This is the current desktop setup I use. I find it's very usable and all the lighting you see in the photo (minus the desk lamp sticking out to the left) was only fifty dollars added together. Coolest part is the IKEA Dioder LED strips. 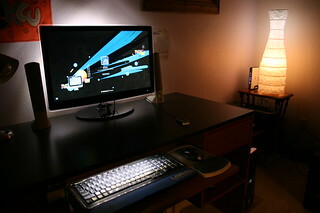 There are two behind the monitor (stuck on diagonally in an upside-down V shape), one under the desk for keyboard lighting, and one hanging down from the top of that vase-shaped lamp. The reason for a LED strip under the lamp is that the lamp seems to block off the light to the top part of it because of its shape. To compensate, I dangle a LED strip over the top and route the wire through it and to the bottom. On the desk there's a Harmon/Kardon 2.1 speaker set, a 24-inch SyncMaster P2570 screen, a generic work lamp, and an Upek Eikon fingerprint reader. The keyboard is a Kensington SlimType (a joy to type with) and a Logitech MX wireless mouse. The entire setup is powered by my HP computer. Out of this picture to the right is another desk (my dad's) with a 22-inch screen and a HP computer... other than that, there's nothing much to tell.